- V 2848 is the UK cat number. Decent press, good album. I purchased it for the track 'All I Need', it's an old favourite. I think that the line up is a bit discombobulated. Having said that, that's an appeal for some people. This album to me is brilliant and is one of those albums that will never get old. When I fist heard them I heard and saw Talkie Walkie live I was truly blown away by the changes, beats, layers and beauty. 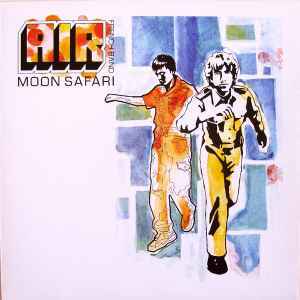 I then bought Moon Safari and literally took me back to my childhood memories of the late 70s with this weird modern adaptation. I am not sure how they achieved this sound but Moon Safari, 10 000 HZ, Talkie Walkie, Virgin Suicides are just amazing albums. Pocket Symphony and the other one doesn't capture what I was looking for in the earlier albums. These guys are talented and hope they continue to impress us with more music like Moon Safari. This is one of those albums that i put off listening too forever. Once i finally sat down to listen to it,my mind was blown. There are brilliant parts in this album. Of course it helps to be mentally stimulated when listening. A true masterpiece. I see a lot of people here that claim the music is too easy, or not complex enough. Although I do agree with the absence of complex layers et cetera, I don't see why that has to be a problem. The beauty lies in its simplicity and the real reason you should listen to this record is the flow and the soothing melodies. Music does not have to be complex to be good. This record is one of a kind, it takes me away on a trip every time I listen to it, and that, for me, is all that matters.